Unless otherwise noted, all photos by Zeon Santos. Since I was a kid, I loved ghosts and haunted houses and Disneyland’s Haunted Mansion has always been one of my favorites and I’m sure many of you agree. But what do you really know about the mansion and the stories behind its layout and design? 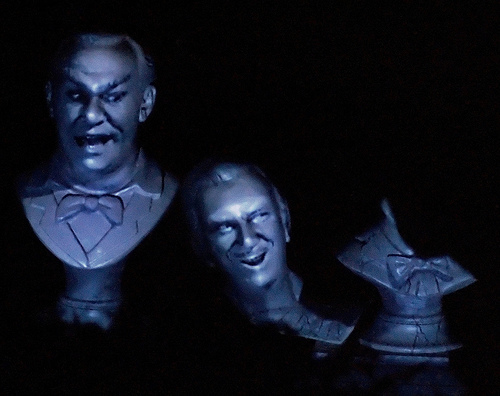 The history behind the ride is almost as cool as the experience itself, so for today’s Neatorama Facts, I give you an inside look at the Haunted Mansion. Image via Passport to Dreams. 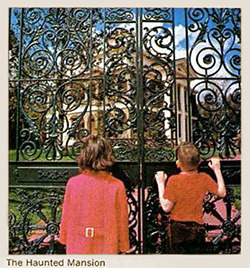 The Haunted Mansion wasn’t open until 1969, but the idea was kicked around since the beginning. 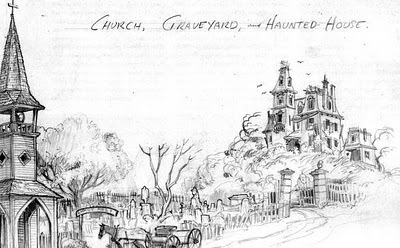 In the one of the original park designs created by artist Harper Goff showed a crooked street coming off of Main Street and winding past a church and a graveyard and leading to a run-down mansion on a hill. The idea wasn’t incorporated at first, but Disney liked the idea and assigned imaginer Ken Anderson to build a story around the drawing and create a full experience around it. 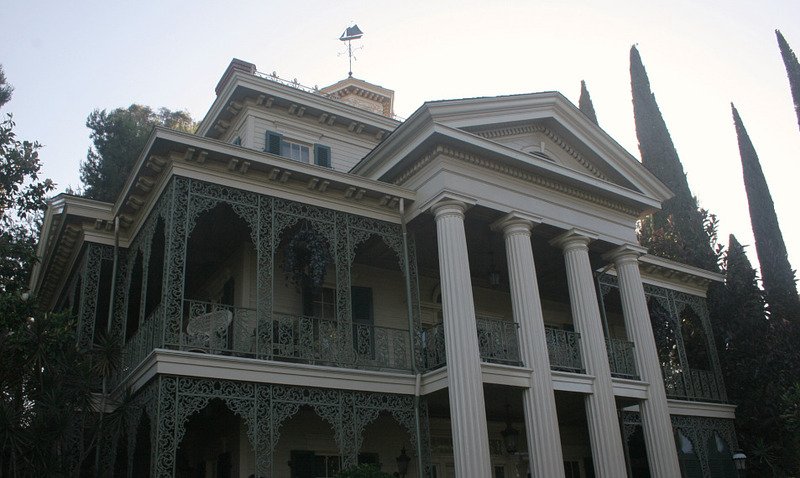 Because plans for New Orleans square were currently in progress, it was decided that the ride would be built in the style of an antebellum manor. The original souvenir map that showed New Orleans Square promised that the area would include a thieves market, a pirate wax museum and a haunted house when it was open. The first drawings for the mansion showed it overgrown with weeds, filled with swarms of bats and having boarded up doors and windows. 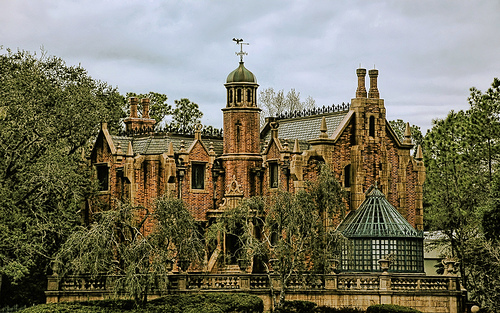 While this certainly would have set the mood for a scary adventure, Disney hated the idea of a run-down building in his park and insisted, “we'll take care of the outside and let the ghosts take care of the inside." When working on the original plans for the mansion, Anderson developed a number of wonderfully chilling tales, the main of which revolved around a ghost of a sea captain who killed his nosy bride and then hung himself. He was even hoping to incorporate some of the monsters used in Universal films. Most of this ended up not materializing because Disney wanted to take things in another direction. For the special effects, Rolly Crump and Yale Grace were hired to create creepy effects that would be far from obvious. The pair researched real haunting stories, Greek myths and monster movies and then started building elaborate effects in their private studio. The effects got to be so good that they scared some of the cleaning crew. Thinking that was funny, they hooked up all the effects to a motion sensor so it would all go off when the cleaning crew entered the room. After that, the crew refused to enter the area and they had to clean up their own studio. Despite all the work on storylines and effects, things didn’t progress very fast and then the imagineers were held up by Disney’s active role in the 1964-1965 World’s Fair. While this didn’t end up speeding the process up, it did actually end up becoming an important part of the final project, as it made the creators realize that the attraction would be far too busy for people to just walk through, as originally intended. Instead, imagineers decided to use the people mover they built for the fair and used in the Adventures Through Space ride as “Doom Buggies” to carry guests through the exhibit. Three of the main designers of the finished project were Marc Davis, X Atencio, and Claude Coats. Rolly Crump also helped add to the ride, as he proposed a “Museum of the Weird” restaurant be built beside the attraction and filled with coffin clocks, talking chairs, man eating plants, living gypsy wagons and other spooky settings. While the restaurant idea was quashed, many of Crump’s ideas managed to make it into the final version. Claude Coats was design-focused and wanted to create a terrifying atmosphere for the ride, but Marc Davis wanted things to be silly and goofy like traditional Disney attractions. X Atencio was assigned with scripting the ride’s plot line and he managed to mix the two ideas together so the atmosphere begins spooky and eerie and then as the ghosts appear, things begin to get silly. Funny enough, the ride’s many delays led to the façade being up for five years before the ride actually opened and a number of rumors began to circulate as a result. One of the best stories said that the ride was so scary that someone died of fright during testing, so they were forced to tone it down and play up the silliness. Because the ride has just such an arc in its story, the tale is widely believed to this day and is even reported on in the Snopes website. 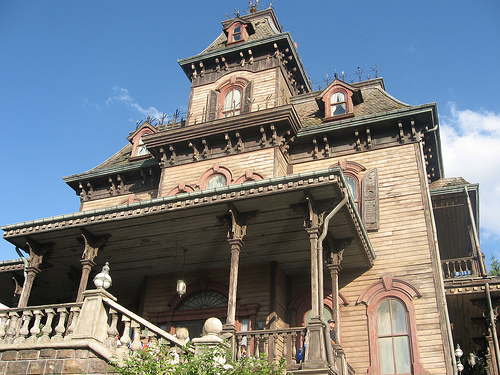 All the ghost stories and urban legends actually helped promote the mansion though and the opening of the ride helped the park recover from Disney’s recent death in 1966. Disneyland is a fairly small park and by the time the Haunted Mansion was set to be established, space was already running out. That’s why the imagineers started the ride off with the legendary “stretching room” that serves as the elevator to help bring guests below the surface level. Once in the actual ride, you go far beyond the boundaries of the park that you can actually visit, under the railroad, and under the back lot, along the tunnels for Splash Mountain. X was perhaps one of the most important fathers of the mansion as he not only scripted much of the ride, but he also wrote almost all of the verses seen on the tombstones and co-wrote the famed “Grim Grinning Ghosts” that serves as the ride’s theme song. 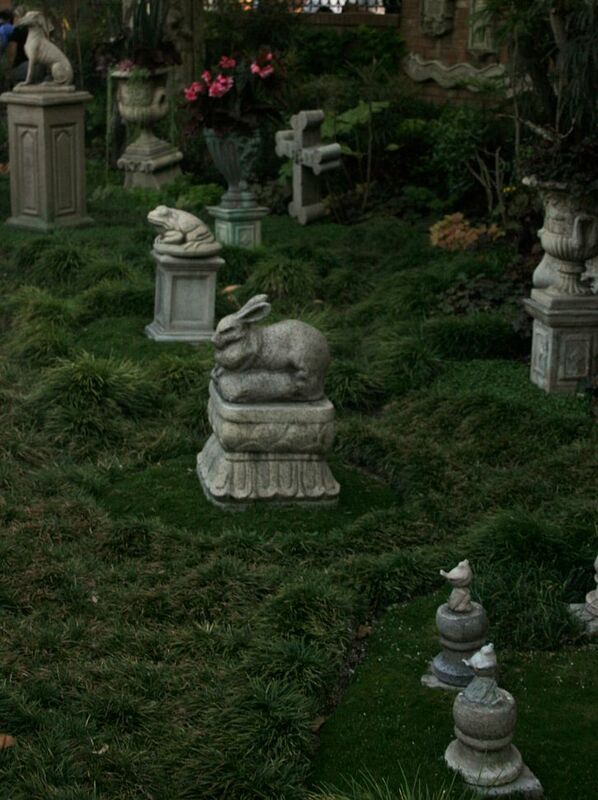 Nowadays though, these memorials have been removed to expand the waiting area (X took his home with him) and a newer pet cemetery has been added in front of the mansion. There is also an older pet cemetery with headstones scattered about, but this can only be seen from the handicap line area these days. 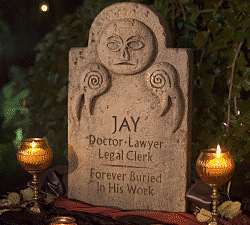 In the Disneyworld graveyard, the pet cemetery also contains a special tribute, a headstone for Mr. Toad that was added after the park closed Mr. Toad’s Wild Ride in 1998. The “ghost host” who narrates your journey is voiced by Paul Frees, who is commonly mistaken for Orson Welles, who he was able to do a great impression of. You might also recognize his voice as the Pirates of the Caribbean ride, or as the narrator of Great Moments With Mr. Lincoln. He was also the narrator of a number cartoons and stop-motion animations, most notably Donald in Mathmagic Land and the Rank and Bass Christmas series. Perhaps the funniest credit he has to his name though was the voice of “Josephine” (Tony Curtis’ female role) in Some Like It Hot. Throughout the entire ride, the “Grim Grinning Ghosts” song is played, although the version changes from room to room. The singing busts in the graveyard actually depict the real singers of the tune and the one most people mistake for Walt Disney is actually Thurl Ravenscroft, who is also well known for doing the voice of Tony The Tiger and his work in the animated version of How the Grinch Stole Christmas. If you’re wondering how the busts sing, it’s actually just projections of the singers shot at busts with the actors’ features. The same effect is used for Madame Leota as she floats in her crystal ball. 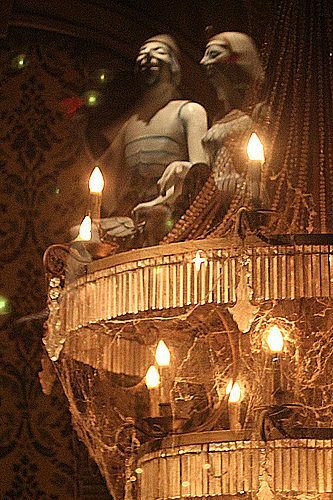 Speaking of effects used in the mansion, one of the coolest is the ballroom filled with dancing ghosts. The ghosts are not actually holograms, but are instead reflections of dancing animatronic figures located above and below the doom buggies track that shine on to a glass plate set in front of the viewers. Marc Davis, who designed the room did forget one thing when he set up the ballroom, reflections show up in reverse. As a result, if you look closely, you’ll notice that the women dancers lead the men. Another cool bit of trivia, the organ being played in the ballroom is the original organ used in 20,000 Leagues Under the Sea. Another favorite effect is the appearance of hitchhiking ghosts in your doom buggy. This is done through the use of a conveyor belt carrying the ghosts at the same speed behind the wall and two-way mirrors which show the ghosts using weak lights. Remember the Moving Suit of Armor? If you were one of the lucky few who got to ride the attraction at its very start, you might have a vague recollection of a suit of armor that actually moved around and walked the halls. If so, you’re not crazy, when the ride first started, a cast member would roam the halls in the suit of armor. Because the cast members weren’t supposed to be seen entering and exiting from the dressing room, they were given a remote control to stop the ride. Unfortunately, this resulted in the ride constantly being stopped whenever someone would spit at the character or throw something at him. The dressing room is still around and is hidden behind the breathing doors. All Disneyland parks have a Haunted Mansion, but each one is a little different from one another, with the exception of the French Phantom Manor, which is very different from the others. In the Disney World mansion (seen above), the exterior is done in a Dutch Gothic Revival look because it is located in Liberty Square. Because the park had more space, there are a few more rooms, including a library that features flying books, moving ladders and an invisible ghost reading a book in a rocking chair. There is also a room that looks like something M.C. Escher may have drawn up that features staircases going in all variety of directions and green footsteps moving across them. The Tokyo park is almost identical to this one, except that the outside features broken windows and the narration is in Japanese. The Phantom Manor of Paris though, follows a completely different storyline than all the other rides. The design of the Manor looks quite a bit like the house in Psycho, but Disney says it was based on the Fourth Ward School House in Virgina City, Nevada. Personally, I think it looks much more foreboding. 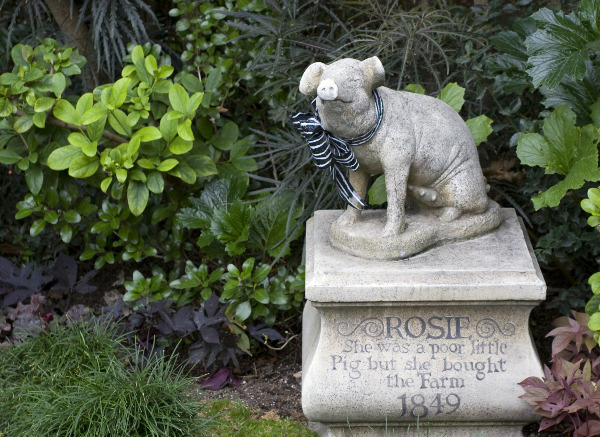 The story of the Parisian manor follows the story of a young woman named Melanie Ravenswood and she is predominant throughout the ride, starting with an exterior headstone. Because the ride is located in Frontierland, there are a number of Western-themed displays in the ride, but it is otherwise similar to the original Haunted Mansion’s layout and story. The story of Melanie Ravenswood says that she was the daughter of a man who made his fortune in the gold rush and built his mansion in a town that’s now run down. Melanie wants to marry a train conductor who promises to take her away from it all, but her father wants to stop the marriage at all costs. The father and mother are killed in an earthquake shortly before the wedding day, but a phantom arrives on the day of the ceremony and kills the groom in the attic (he is the one hanging in the stretching room this time). Melanie swears her groom will return to her and wanders the house throughout the rest of her life dressed in her wedding gown, while the evil phantom and his demonic guests celebrate around her. After the bride’s boudoir (the room that belongs to the black widow in other Haunted Mansions), there is no graveyard scene, instead the doom buggies visit the backyard where the phantom sits laughing above an open grave. They then travel to underground catacombs and then pass into Phantom Canyon, which is a supernatural version of Thunder Mesa where an earthquake is going on and ghosts rule the streets. 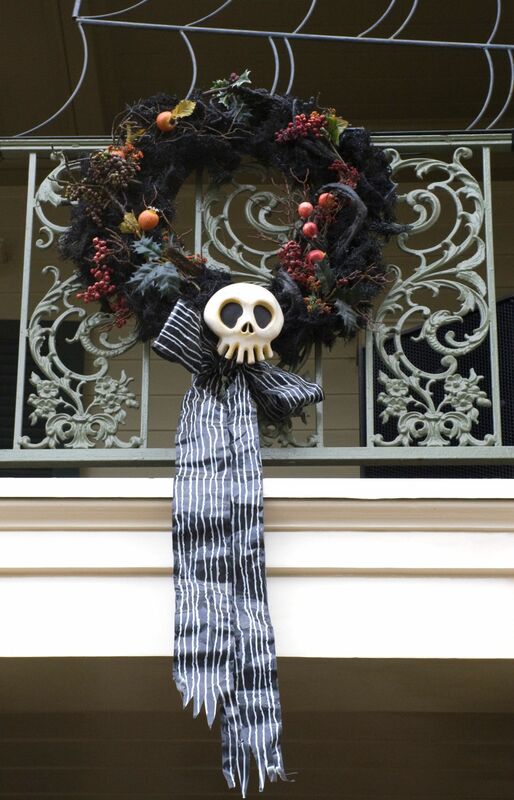 Ever since Christmas of 2001, the Disneyland Haunted Mansion has been decked out yearly for the Haunted Mansion Holiday, featuring the entire cast of The Nightmare Before Christmas. Tokyo has had similar redecoration, but the Paris and Florida parks have never held a similar overlay. This was not the first Christmas overlay on a ride and The Country Bears and It’s a Small World both received the treatment before, but what makes the Haunted Mansion Holiday special is its use of spooky characters from the Tim Burton film. The special Christmas layout became so popular that it was responsible for the decision to add a Fast Pass to the ride. Now, there’s plenty more secrets of the Haunted Mansion and I’m sure many of you can help fill in the parts I left out, so be sure to add your own trivia in the comments. Sources: Wikipedia #1, #2, #3, #4, #5; DoomBuggies.com #1, #2, #3; Mouseplanet; Passport 2 Dreams; 2719 Hyperion; and Disneyland: Little-Known Facts About Well-Known Places. I remember going to see it new in 1970. And as a small child I was terrified. I love the Nightmare before Christmas stuff. It was looking stale and needed some updating. I understand the viewpoint of wanting it to stay all original too. But my kids didn't care for it much until they added the Nightmare stuff, so I think it's a good move. I love this mansion soo much I got the wallpaper logo tattoed on mah arm! :) I actually like the changes they made. At first I didn't, but then I went on the ride at Disneyworld (which is a little different, but mostly the same ride) and saw the differences in the attic scenes... and i liked it much more. The attic always seemed tacked on and now it has a real story to the bride with the bleeding heart.